Mrs. Rickette writes to send $1.00 and expresses her desire to send more support. She also notes her change of address. 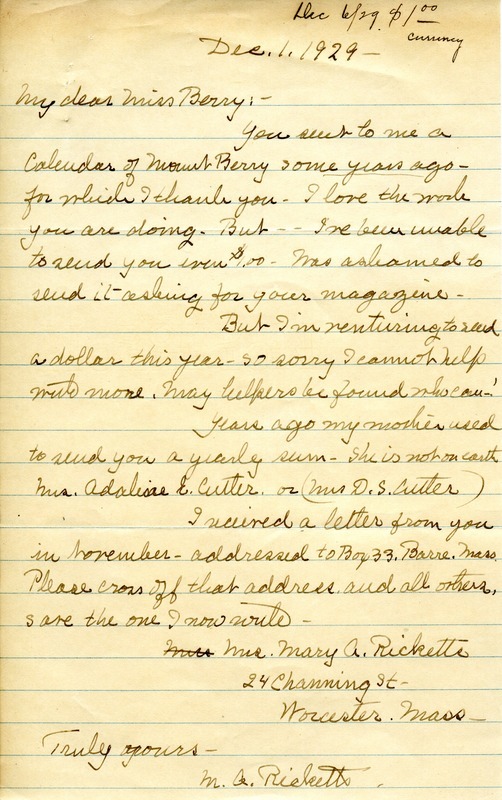 Mrs. Mary A. Rickette, “Letter to Martha Berry from Mary A. Rickette.” Martha Berry Digital Archive. Eds. Schlitz, Stephanie A., Chelsea Risley, et al. Mount Berry: Berry College, 2012. accessed April 24, 2019, https://mbda.berry.edu/items/show/10871.